You can't just finish playing at the playground then expect to kill it at cheer practice. If you want to be a talented cheerleader then we both know that it involves dedication and discipline. And if you're ready to seriously launch your cheerleading career then you've come to the right place because we can hook you up with a costume to transform you into a seasoned cheerleader, as long as you're ready to put in all the hard work. Once you've finished stretching your legs and arms, then it's time to practice your cheering skills. Make sure that all your moves are clean and precise. Reach those arms out to the sky, making them as straight as possible. Once you have that down then you need to do the same with your legs. Once your low v's and high v's are perfected then let the tumbling begin! It's wise to get a coach who specializes in cartwheels, round-offs, and back handsprings because those are the essential aerobatics one must master when becoming a cheerleader. Keep in mind all cheering routines feature flips of some kind! Finally, once back flips are in your skill set then you can don this costume! 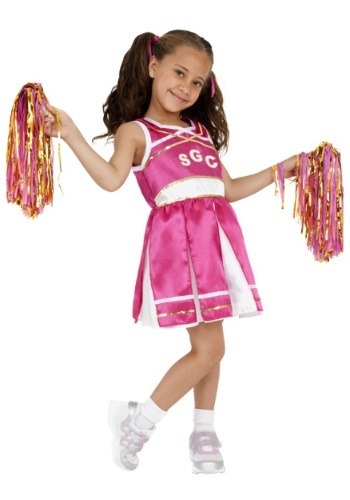 This pink sleeveless dress has all the classic features of a real cheerleading uniform. Little girls will love the girly details like the skirt pleats and gold ribbon trim. Another key staple of this cheerleader girls costume is the pom-poms which arguable might be the best part of this costume. Pretty soon she'll be rah-rahing while doing back handsprings!